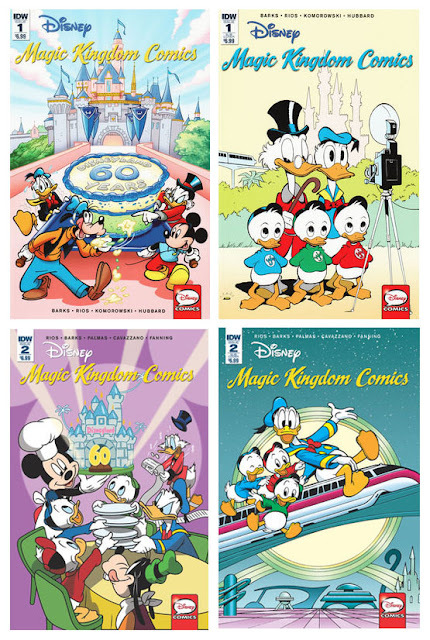 The second issue in the two-part mini-series Disney Magic Kindom Comics came on sale last week. This mini-series is celebrating 60 years of Disney parks, and not just that Disneyland in California turned 60 last year – so we have stories from Disney World and Disneyland Paris too. 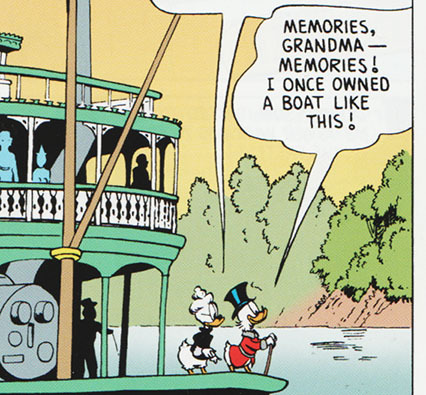 This story by Carl Barks has Uncle Scrooge and Grandma Duck taking the Mark Twain Riverboat at Disneyland, where Scrooge is telling about his steamboat days at the Mississippi River. The first thing to notice in this story is that Scrooge is referring to Grandma as just "Grandma" too, and not Elvira (or any other name) like we recently saw he did in Scrooge's Last Adventure. 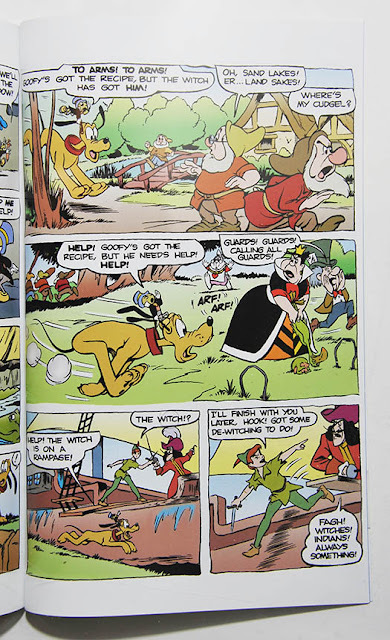 But most of the story is taking place in Scrooge’s past, where we get to meet Blackheart Beagle and his brawling sons and Gyro’s grandfather Ratchet Gearloose. For any fan of Uncle Scrooge or Don Rosa’s The Life and Times of Scrooge McDuck, this story is a must-read. 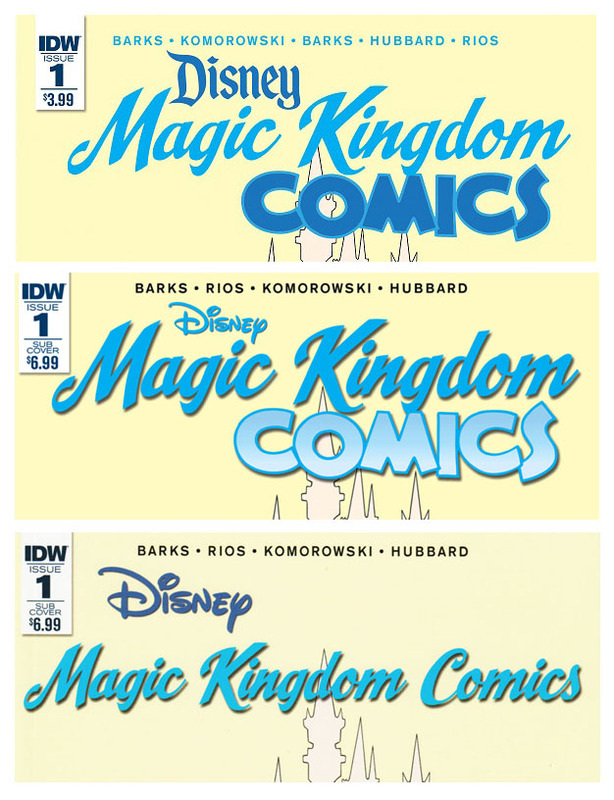 This is the story I was personally looking most forward to in the first issue of Disney Magic Kindom Comics. I’ve read it before in the British Donald and Mickey, but like most stories in that title it’s heavily remounted and edited. I suspected it was cut too, but comparing the two prints it’s actually not as bad as I thought. I’ve never seen the original Digest version, but I think the story is slightly edited to fit a new layout in the IDW print too. On the image above, the IDW print seems to have cut half the panel, but I'm not sure how the original looked. Under is a comparison of the layot in the British and IDW prints. 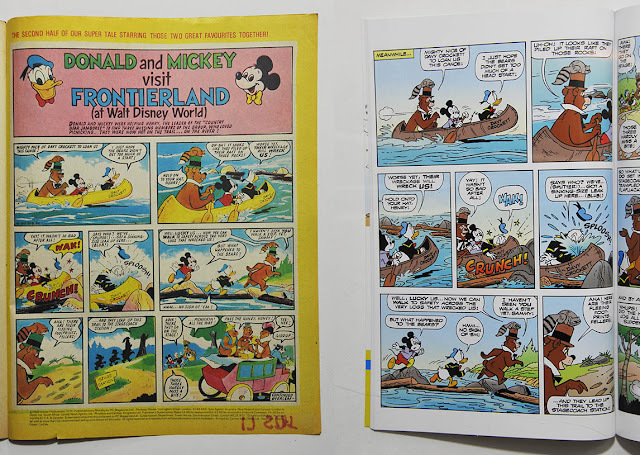 As you can see one panel with Donald and Mickey in the canoe has been cut i two halves in Disney Magic Kingdom Comics. While most characters you find in Disney parks are based on movie characters, the Country Bear Jamboree is an original attraction that later made it to the movies – and in this case the comics. 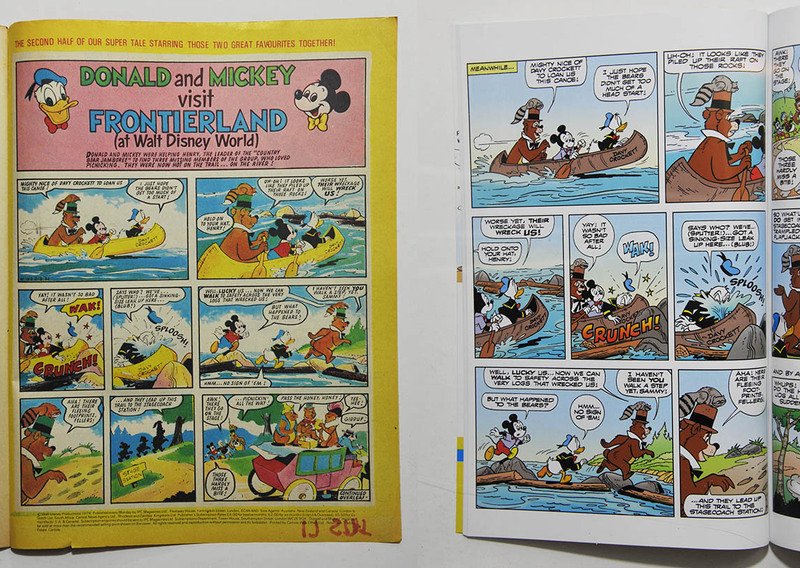 We got a cover with the bears last year, but I think Donald and Mickey in Frontierland is the only comic story with the characters (?). In the story we have Donald and Mickey wanting to see the show, but three of the bears have disappeared! Then rest of the story takes place around in Disney World trying to find the missing bears. Another story told by Scrooge, this time in Disneyland Paris with Daisy, Donald and the boys. But according to inducks only two of the five were previously published in the USA, so even with Red Rogue's Treasure now being published there are still two left. 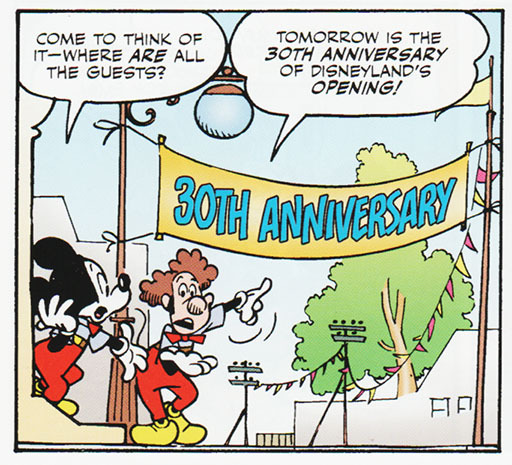 The second issue of this mini-series starts off with another one of the 1992 Euro Disney stories. This one is actually published before in Uncle Scrooge #269. Again we see memories from Scrooge’s past, this time competing with Glomgold. As Scrooge and Glomgold are working together at Plunkett's Emporium, this story from Scrooge’s youth must take place after the events in The Terror of the Transvaal. This Carl Barks story might not be an obvious Disneyland story as it appears to take place at the real Matterhorn. But we do have the "toboggan ride", and probably closer to how Walt Disney originally imagined it (maybe without the rockets…) than the roller coaster it ended up being. Reading the original comic with the intro page, it becomes more obvious that this is a Disneyland story. 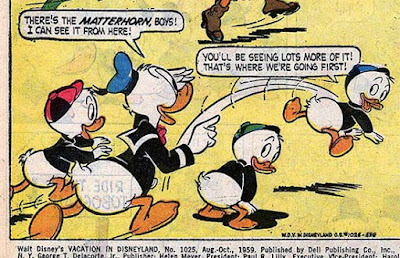 This story is one of the "Phooey"-stories as one panel actually have four nephews, with Phooey being the fan name for the 4th. But for some reason IDW decided to correct this by removing one of the nephews! You can barely see him, and it’s a nice little Easter egg to look for – so I think they should have just left him there. 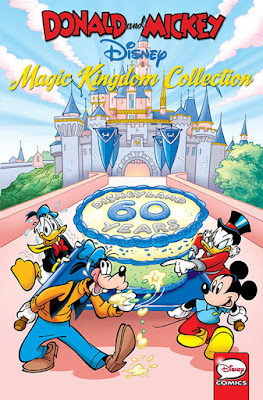 Another new-to-the-USA story originally made for Disneyland’s 30th anniversary. If you missed out on the first issue or can’t find one currently on sale – don’t worry! Both issues are going to be collected in a trade paperback, scheduled for a December 2016 release. And all IDW trades can easily be ordered from various online bookstores. "The first thing to notice in this story is that Scrooge is referring to Grandma as just "Grandma" too, and not Elvira (or any other name) like we recently saw he did in Scrooge's Last Adventure": this may sound like nitpicking, but I want to point out that the name Elvira in that story is a translator's addition. There are several Italian stories from the 1990's onwards that use Elvira as Grandma's name, but "Scrooge's Last Adventure" is not one of them (in the original version, at least). I don't like the concept of "Plunkett's Emporium", since Scrooge wasn't supposed to learn Glomgold's name until "The Second-Richest Duck". About the "fourth nephews" goof: I think Barks mentioned once that he was supposed to delete one nephew from that particular panel (after drawing three of them on the top) but later forgot to do so. I am glad it was removed since there was no need to keep an obvious blooper, even though not everyone would have noticed. Anonymous: "I don't like the concept of "Plunkett's Emporium", since Scrooge wasn't supposed to learn Glomgold's name until "The Second-Richest Duck"." In the story Scrooge remember working at Plunkett's Emporium, and falls asleep on a bench. Then we get the story from his past while he sleeping. So it’s possible to argue that the entire story from Scrooge’s past is just a dream. But yeah, Scrooge should have remembered who Glomgold was in "The Second-richest Duck" if he had worked with him before. Don Rosa also made point out of not getting to know his name in "The Terror of the Transvaal".